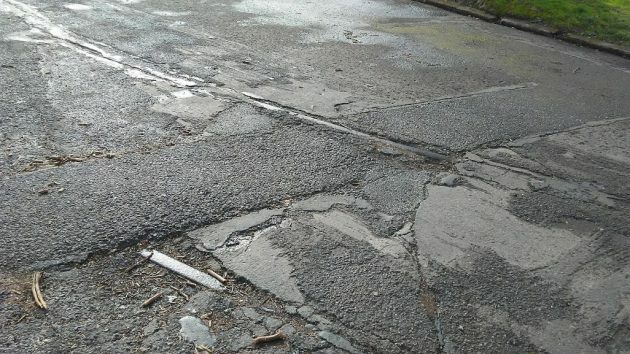 There’s a curved railroad track partly buried under the pavement at Fifth and Baker in Albany. How come? I’ve looked for clues in various archives, but so far I haven’t been able to learn why there are remnants of a railroad track buried in Baker Street downtown. I noticed the rails on a casual jaunt on the bike the other day. In front of the former Oregon Electric depot, now Ciddici’s, Fifth Avenue still has portions of the line. That much is well known. The track ran the length of Fifth from East Albany until rejoining the Water Avenue branch of the OE near the Calapooia River on the west side. But why was there an apparent spur off the Fifth Avenue line running south on Baker Street? Where did it lead? Various Albany maps going back to the 19th century show all kinds of now defunct railroad lines, but none anywhere on Baker Street, let alone on the block between Fifth and Sixth where the track is very much in evidence today. The pavement has cracked in places, letting the steel rails show. The maps I looked at are available at the Carnegie Library downtown. Looking for more maps, I scoured the Oregon history room in the library’s basement, without luck. What about trolleys, a helpful librarian suggested. Albany did have a trolley line. But according to everything I’ve seen, including the several references and photos in the late Bob Potts’ “Remembering When” picture books, the trolley ran north from the Southern Pacific depot, up the middle of Lyon Street. It made a turn at First Avenue and ran westward on First to the St. Charles Hotel, now the site of the Albany Carousel. So, no trolley tracks running north and south on Baker. Yes, back in the day, a century and a quarter ago, trains ran north and south through old Albany, but that was two and six blocks to the east, respectively, on fittingly named Railroad Street and Lafayette Street. They still run on the latter, of course. This 1926 Sanborn map at the downtown library shows no track on either Fifth or Baker, though we know the OE ran along Fifth. But there’s the evidence on Baker Street that a railroad once ran there. Could the museum possibly know anything? Looks like a “Historic Landmark” to me. Sarcasm…the last refuge of wit. I love your sarcasm or wit, whatever they want to call it. And, it rings true. The city gave a promenade to the old shut-down public restroom to the side of the old city hall and police station. The promenade runs between 3 and 4th up to the new city hall palace. If it had been completed years ago (according to the original plan), it would have continued to the river. And we wouldn’t have the continual whining about why CARA has been slow to complete its mandate…. Perhaps a siding leading to a long gone loading dock? To toss in some info, Albany was once referred to as “The Hub City” owing to the many R/R lines north, east, south & west emanating from the main station. Some were main lines, some where secondary lines or temporary “logging” lines to feed local mills. 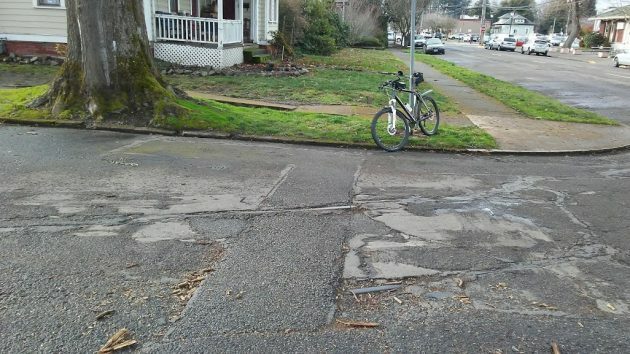 It’s gonna cost some $$$ but maybe some CARA cash ought to fix those few blocks. As a youth in the early 50es I would hear the “hub” references on the radio and knew where “The Hub”, which I believe was a restaurant, was located but never went or was taken in. Did OE leave any publicly-accessible records? External records tend to show ownership, but not necessarily what happened on the ground. Don’t know the answer. I’ve never come across any. 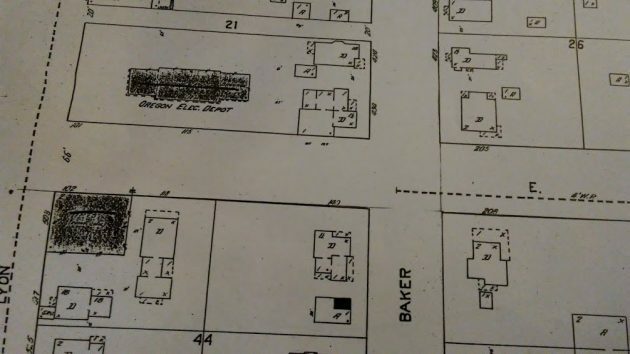 The City has 1917 street improvement plans for Baker Street between 3rd and 9th. The plans show a one-block Oregon Electric spur between 5th and 6th. It is hard to know what the plan was for that section of track. Hello, That piece of trackage is the remnant of the old Oregon Electric Railway passenger trains. The trains came down 5th street from either direction west of east and the track on Baker street, served as a turn around for the passenger trains that arrived and departed from the old Oregon Electric Depot, the now Ciddici’s Pizza parlor. My Mother, her Sister and my Grandmother rode those old trains all over the Willamette Valley. Yes Jim, and there is a similar turn-around on Lafayette St. between 4th and the UP main line. I enjoyed watching the big steamer 4444 turn around there several years ago when they took it back to Portland. Follow up to Mr. Schulte’s and Olsen’s remarks, it’s called a wye and is there for the purpose of turning power or equipment so it can face the opposite direction. Hello Lou, I’m very well aware of what a “wye” is and the wye at the old SP at the terminus of the Toledo branch, is truly a wye. But the trackage near the old Oregon Electric Depot, now Cudicci’s Pizza, was not a wye. It actually circled around city blocks to accomplish what a wye does. In a previous comment, Gordon Steffensmeier referred to a 1917 street improvement plan on file at City Hall. The plan clearly shows a wye at Fifth and Baker, with a spur running just one block from Fifth to Sixth. There’s no indication on that plan of any track circling the block. Well, I guess I was totally wrong!!! Comes as no surprise, there are a lot of “know it alls” in Albany. Enough said! I merely had stated what I had heard from conversations with my Mother, Aunt and Grandmother. Obviously they didn’t know what a “wye” was. Also obvious was the fact that there are a lot of “officianadoes.” who are going to have it their way or nothing!